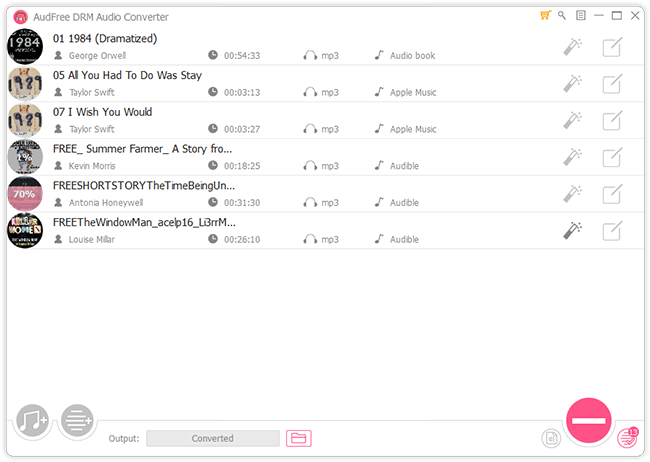 AudFree DRM Audio Converter is the all-in-one audio converting tool, which aims to convert DRM-ed and DRM-free audio files to popular audio formats, like MP4, AAC, M4A, FLAC, WAV and M4B without touching original audio quality. Apart from being a professional audio converter, AudFree Audio Converter is also an extraordinary audio DRM removal tool that can remove DRM from Apple Music, iTunes M4P songs, M4A/M4B audiobooks and Audible books with all ID3 tags preserved. When it comes to bypassing DRM from Audible audiobooks, it supports for setting output format as 100% lossless. What's more, users are able to customize output audio quality by changing audio channel, codec, bit rate, sample rate, etc. Thanks to this smart AudFree Audio Converter for Windows, you can freely listen to Apple Music, Audible audiobooks, iTunes M4P music and audiobooks and other unprotected audio files on almost all devices and MP3 players, such as iPod, Amazon Echo, Chromecast, Sony Walkman, Android tablets, Creative Zen, etc. 1. Updated the UI underlying library; 2. Interface optimization and solved some small bugs.